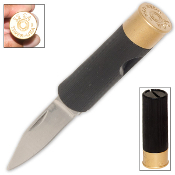 Black 12 Gauge Shotgun Shell Folding Pocket Knife - These new folding pocket knife knives look just like authentic shotgun shells. Each features a razor sharp 1.75" stainless steel blade and impact material resistant handle. Blade folds for easy carrying.